The binomial name for purslane is Portulaca oleracea. Purslane plants have smooth, round, reddish stems and an abundance of fleshy, oval-shaped leaves. 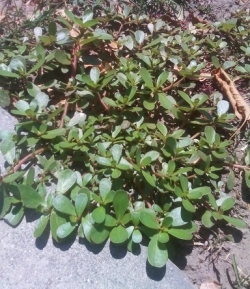 Purslane tends to grow close to the ground in dense patches that spread wide. Purslane flowers are small and yellow. 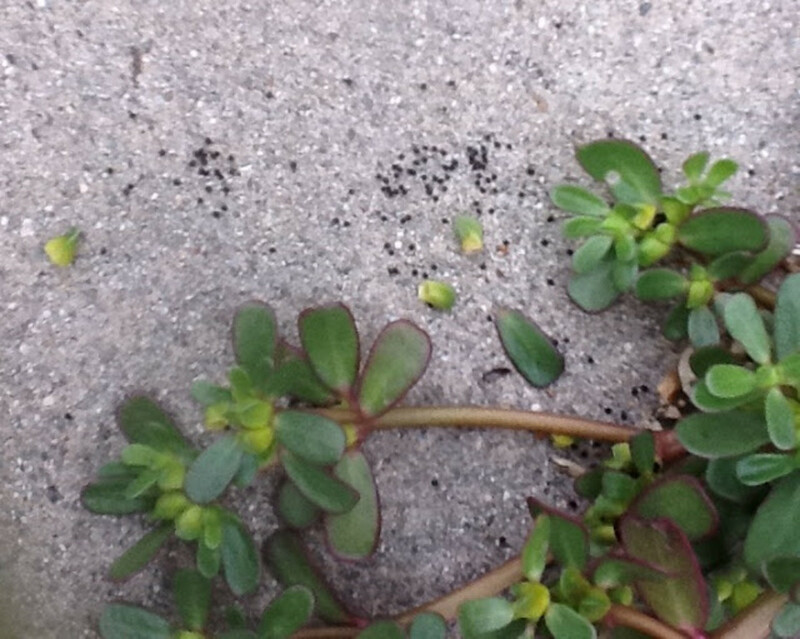 Purslane seeds are tiny, black, and round. Do you see them? 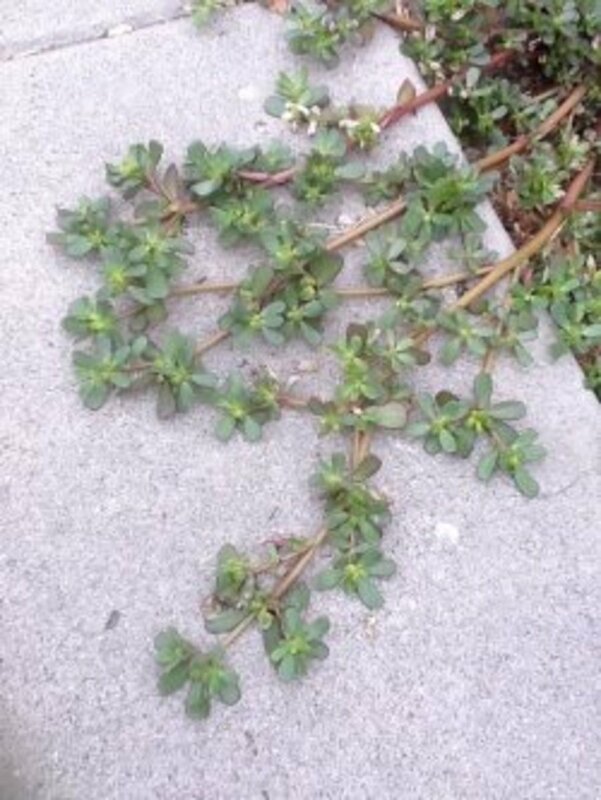 Prostrate spurge (Euphorbia maculata) is another weed that somewhat resembles purslane, but it's toxic (it won't kill you, but it can make you ill). 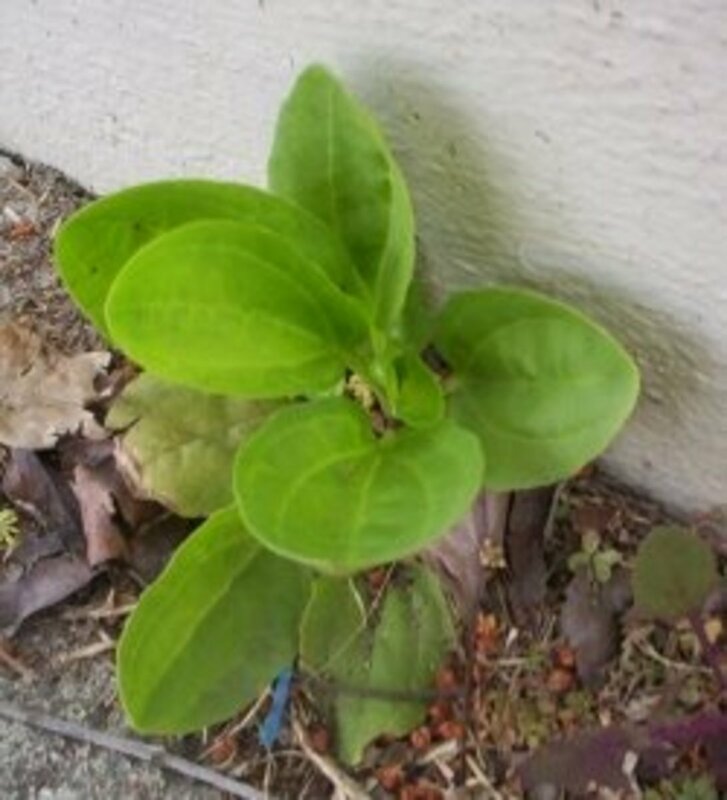 Spurge has a similar growing pattern (low on the ground), but the leaves are thinner and smaller and sometimes have a spot of reddish coloring at the center of the leaf. The stems of the spurge are hairy and the flowers look different. The foolproof way to differentiate between the two is by breaking a stem. The stem of the spurge oozes a milky white sap. IF THERE IS A WHITE SAP, IT IS NOT PURSLANE! 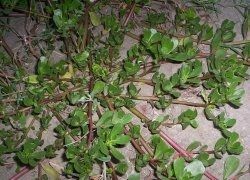 Photos of spurge can be seen at Wikimedia Commons (I avoid putting images of other plants on my weed pages because I wouldn't want a picture of spurge to show up in a Google search for purslane). Here's Green Deane's installment on purslane. Photographed on a sidewalk in Lynwood. There is a nutritional info page on purslane at NutritionData.com. They say: "This food is very low in Cholesterol. 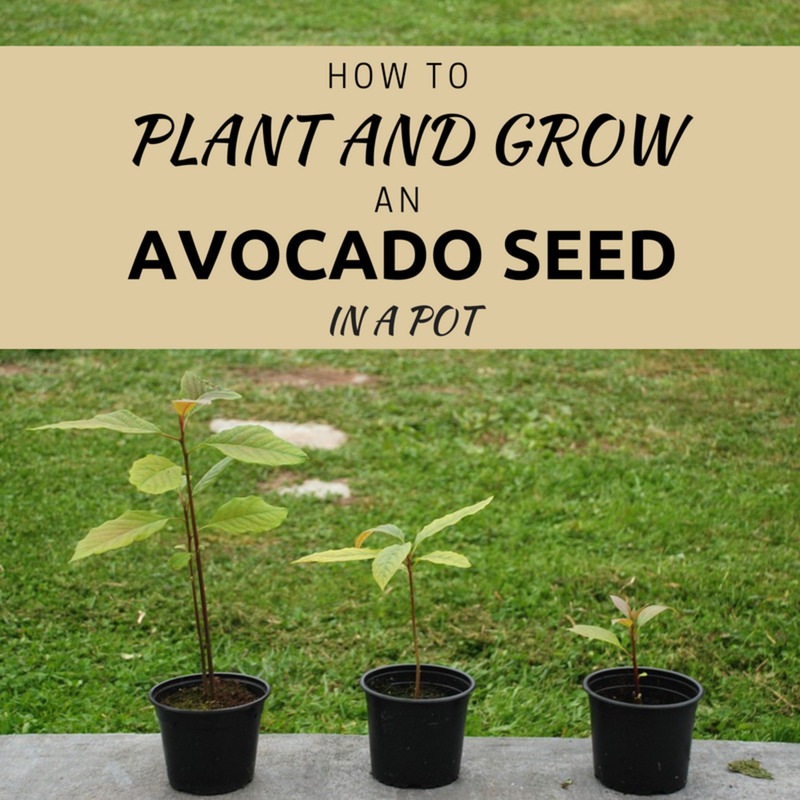 It is also a good source of Thiamin, Niacin, Vitamin B6 and Folate, and a very good source of Vitamin A, Vitamin C, Riboflavin, Calcium, Iron, Magnesium, Phosphorus, Potassium, Copper and Manganese." 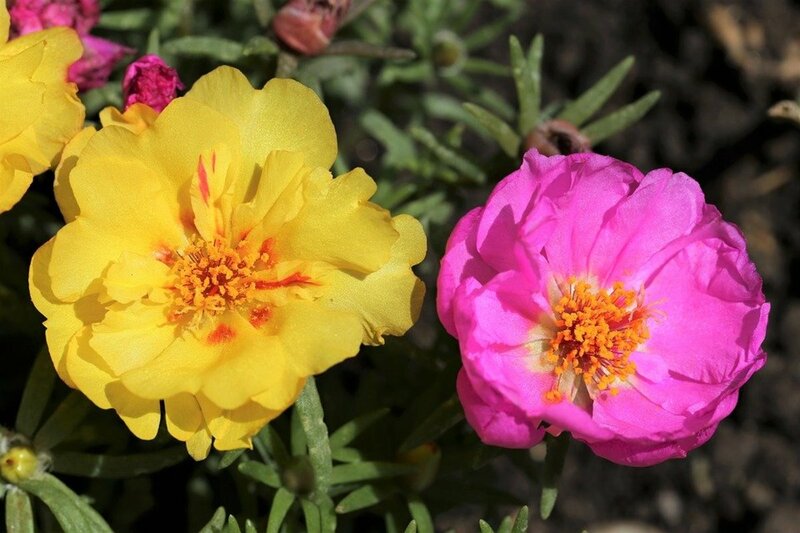 One of the things everybody talks about is the fact that Portulaca oleracea has more omega-3 fatty acids than any other leafy plant known on earth. The leaves, stems, flowers, and seeds of the purslane plant are all edible. I've only eaten the stems and leaves myself. They have a slightly sour edge (not as strong as wood sorrel) and a hint of a mucilaginous quality (not as strong as mallows). Purslane is terrific as part of a salad. A wild shirtless guy makes fried purslane for dinner. Purslane is regarded as a cooling herb and is suggested for help with fevers and inflammatory conditions. Some recommended it for skin problems, similar to the use of aloe vera. What is the phosphorus content of purslane? My aunt just re introduce this plant to us as she had been eating and saw many benefits from it. We have plenty available in Southern Ontario, Canada and I am right now eating some with my lettuce salad. The seeds are used as decoration in berenji, which is an iranian sweet/biscuit. Purslane or khorfe is used in cucumber salad or with other greens as a sidedish , but mostly in the south of iran. I haven't Seen much of a regular consumption in other parts of the country although it grows all over. It's known to cleanse liver and I myself use the dried and powdered leaf and stem in yogurt to accompany dinner whenever I remember. Here in Portugal we eat as well this plant and actually farmers do plantations of it. Purslane is a very common ingredient in Lebanese cuisine other than fatoush a national salad it is used with many other summer salads, us Lebanese also make pours,and pies instead of spinach we use purslane, add sumac and onions, it is very tasty and healthy. After moving to the US I missed purslane so much, I couldn't find the seeds anywhere which eventually I found online and ordered the seeds from the UK, I planted them in planters. I now have two big planters ready to be cut and eaten. Tasty and yummy! purslane is found in indian cooking too. we cook it with dhall or lentils. very delicious. Yum, My grandma used to find this and feed it to us. I remember loving it like I do swiss chard. Can't find much around here, but I can order seeds. Thanks for the info! I'm so happy to see this page here! All summer long my friends were talking about purslane... and I didn't know what it was. Then Lisa offered to bring me a salad which had purslane leaves in it. That was one of the best salads I ever had - I think it was mainly purslane and bean sprouts, with a dressing of sesame oil and liquid aminos. Wow... I was so amazed! Now I'm looking forward to finding purslane in my own garden next year. I love that you're writing about edible wild plants in your area. If the food system breaks down, this information could save lives! Blessed! Thanks so much. Are you kidding me? Someone wants to eat this?! I'll make you a deal you can have all you can pull out of my vegetable and flowers gardens for free and I'll throw in free cucumbers and tomatoes as well! purslane is eaten in fatoosh and salad in Lebanon, it is a very common herb in Lebanon. I hadn't heard that it might be native. 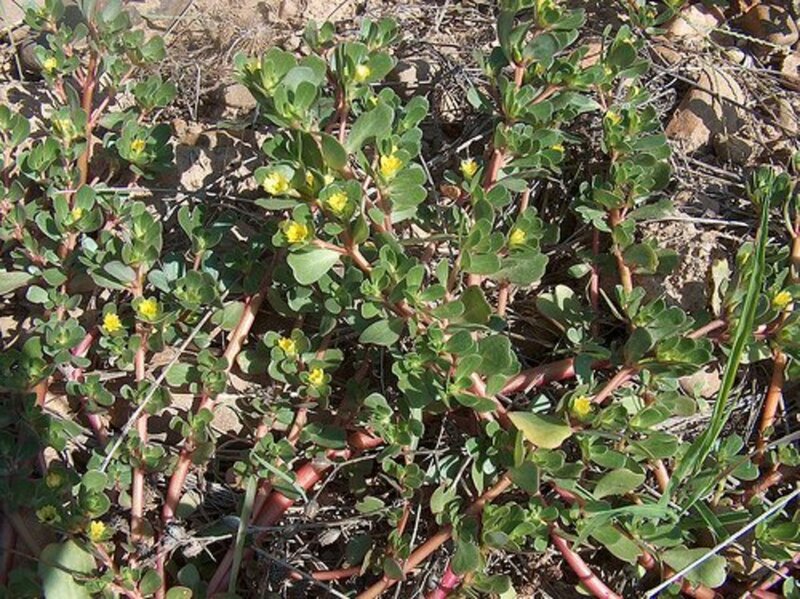 People might also confuse it with Tribulus terrestris (puncture vine), though I would think they wouldn't try to eat that, or Chamaesyce spp., which is where they seem to have moved Euphorbia maculata in some places. 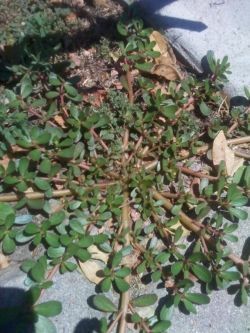 years ago, back before I was into wild edibles I had purslane growing all over my yard and I used to spray it or pull it out of the cracks in the path. 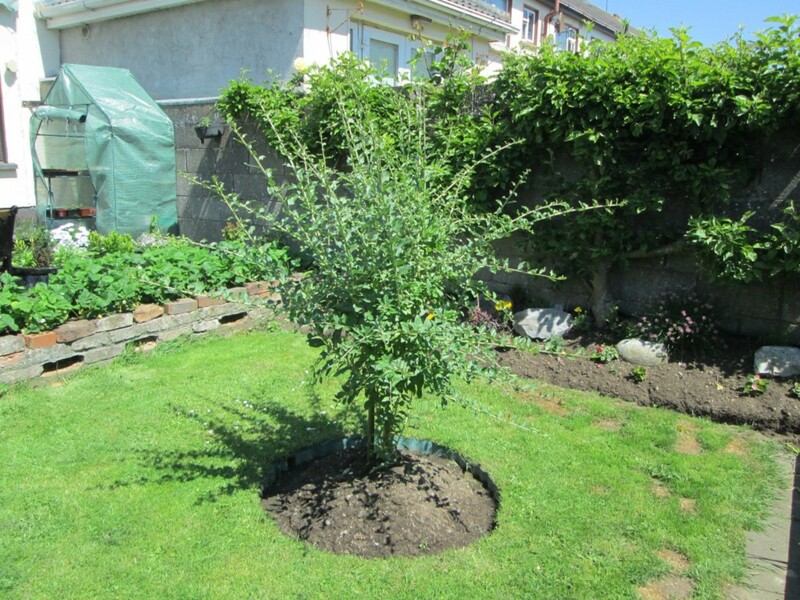 Nowadays that I know better, I do not have it growing wild so I had to buy the seeds and plant it. Funny how life works sometimes! @Sylvestermouse: It is soo easy to tell the diff. between spurge and purslane. Surge grows closer to the ground and it is just smaller. thinner stems. smaller leaves. if you break a stem it leaks white sap. 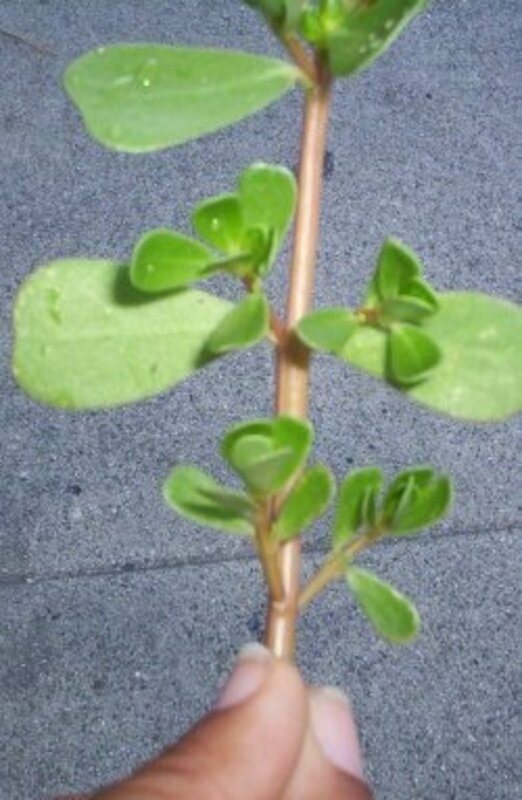 Purslane is larger, has a thicker stem, larger leaves and has no white sap. The leaves taste like lettuce and the stem is a little tangy. Usually purslane and spurge grow near to one another which makes it easier to identify for the first time. Once you have identified it, it becomes as simple as telling a head of lettuce from a head of cabbage. I eat purslane. The leaves taste like more like lettuce and the stem is a bit tangy. 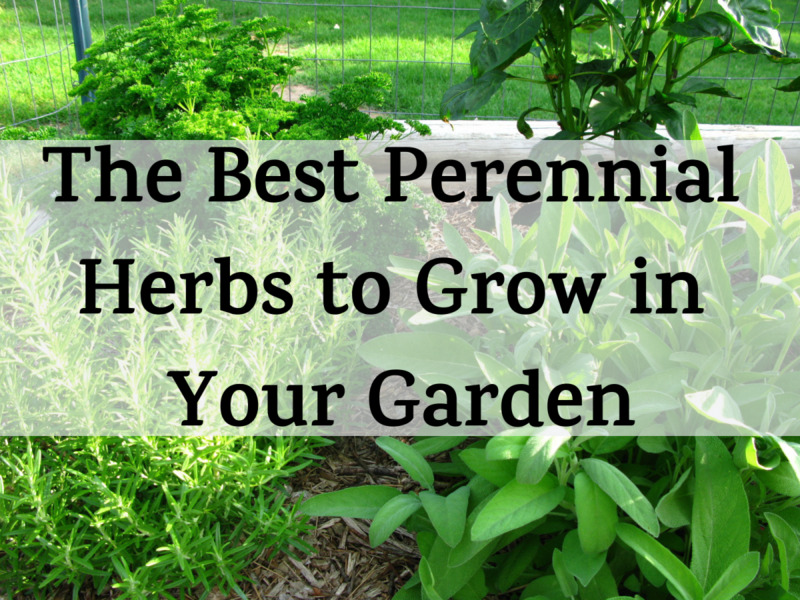 Great article and I especially like the spurge that you've pointed out! Now I know I saw this growing in my sister's flower garden. I thought it was beautiful and asked what it was but she didn't know other than it is a weed she loves and welcomes in her flower gardens and has even put them in pot arrangements. It is very easy care. Now to find out its good to eat, I can't wait to tell her about it. I love this series of yours. I've found lots of wood sorrell growing near my yard after looking at that site of yours, and now I'm on the hunt for purslane. 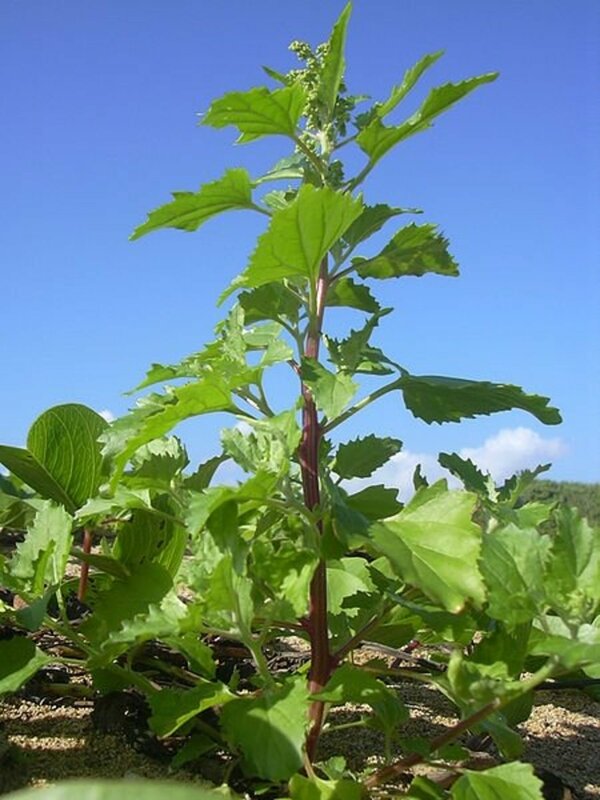 These edible weeds sites are great! @dc64 lm: So glad to hear it! Enjoy! Ah, you beat me to it. I was going to do a lens on this. But I'm keeping busy with other lenses, and you did a great job with this. I need to start paying more attention to weeds, I'm sure I've seen this one before. I love the idea of urban foraging and have heard a lot about how great purslane is. Great lens!